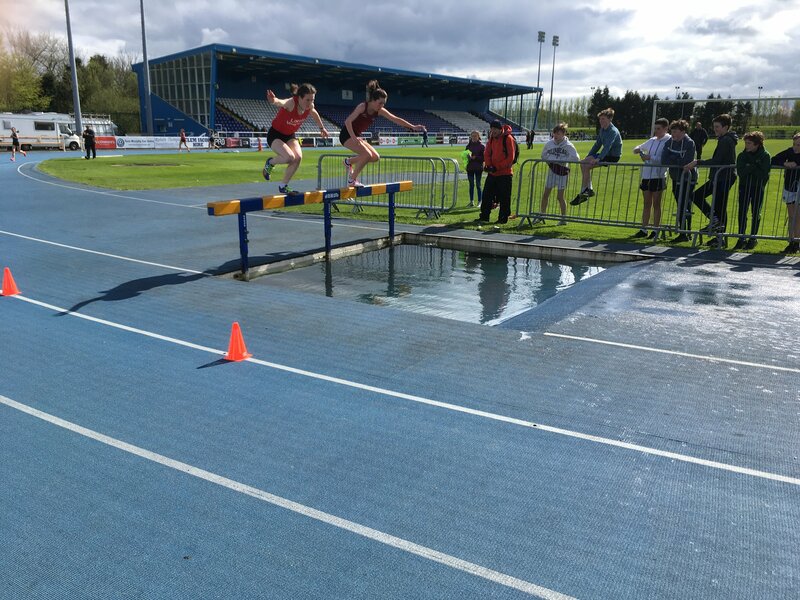 The secondary schools track and field season got under way on Friday, April 27, with the first day of the South Leinster Schools Championships in Waterford. At stake was school pride and qualification for the Leinsters. With only two to qualify from shorter races and three from middle distance, jumps and throws, making it through to provincial level was not to be taken for granted. Saidhbhe Byrne, of Coláiste Bhríde Carnew, secured her place in the Leinsters with double Gold in Minor Hurdles and Shot Putt. The talented young all-rounder did not let a long delay on the start line of the Hurdles race unsettle her, putting technique and experience to good use as she took the win. Elaine Oladiran, FCJ Bunclody, won Gold in Junior Shot. Eimear Halpin, Loreto Wexford, won Minor Discus and also made the final of the 75m Hurdles, finishing 4th. Rachel Gregg, Presentation Wexford, jumped a pb (1.40m) in taking Gold in the Minor High Jump. The school showed its strength-in-depth in field events with two further medal-winning performances: Triini Jurisco won a Silver in the Junior Hammer and just missed out in Long Jump; Sophie Kelly took Bronze in Junior Shot Putt. Aisling O’Brien, Mercy New Ross, won a Silver in Minor Discus and Bronze in Junior Hammer. Competing for CBS New Ross were Jacob English who got Silver in the Senior 400m Hurdles and Tadhg English who placed 4th in Junior Long Jump. St Mary’s had a successful day with Triona Mooney an easy winner of the Senior Walk and three Silvers going to Aoibhinn Crean, in Junior Walk, Ellie Cloney, in Junior Triple Jump, and Ciara Mooney, in Minor Javelin. Sinéad O’Reilly, Loreto Wexford, improved on her 500m Silver at the All-Ireland Loreto Schools the previous day with a Gold in the 500m. 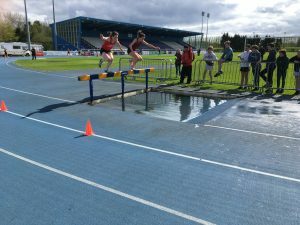 Róisín O’Reilly, also Loreto Wexford, ran her first ever steeplechase in the Intermediate class, the distance 1500m. She settled into the race well and followed the lead girl (a Senior!) for the early part of the race until easing ahead and romping home to take the Gold. Claragh Keane of Presentation Wexford placed a spirited 3rd in the Junior 1500m. Hanging well off the pace in the first lap she got down to business over the second lap and fought her way to a fast finishing Bronze medal position. Ciara Mullally, Our Lady of Lourdes, had a very successful day winning Silver at Minor level in both 100m and 800m. Ben Wall of Good Counsel took Bronze in the Junior 1100m. Conor Doyle, CBS Enniscorthy, was 3rd in Junior 800m while Eimear Fortune, Loreto Wexford, was 3rd in the Junior Girls 800m. Darragh Flannelly (Good Counsel) picked up Silver in 800m and also in the Relay. Orlaith Deegan, FCJ Bunclody, won a pair of Silvers in Minor Girls 500m and High Jump, the latter coming following countback. Darragh Breen, also FCJ Bunclody, was 5th in Minor 800m . Sophie Codd of Coláiste Abbain was 2nd in Inter 300m Hurdles. Darra Casey of CBS Enniscorthy took Bronze in Inter 400m Hurdles. Anna Finan, Coláiste Bríd Enniscorthy, came 3rd in the Minor Girls Hurdles. Brídín Doyle of Coláiste Bhríde Carnew won Gold in the Junior 1200m Walk. Jack Byrne, Gorey Community School, placed 2nd in Junior Walk. Jack is new to walking and, following on from his indoor Bronze, is improving at the event all the time. His school-mate Elizabeth Gahan took Silver in Junior Girls 100m. There were two medals in race walking for New Ross with Ciara Murphy (St Mary’s) picking up a Bronze and Ryan Kielthy (Good Counsel) a Silver. Loreto Wexford had Emma Carr in the Junior Long Jump and 200m and Bonnie Murphy in the Minor Long Jump and High Jump. Both girls competed well but were just outside the medals. Ciara Martin for Presentation Wexford was unlucky not to advance to Leinster in Junior 800m placing 4th. Despite battled hard on the back straight she was denied a podium place. Ailbhe White, Pres. Wexford, ran a gutsy 800m and was unlucky in ending up outside the medals in 5th. Jane Sinnott, Loreto Wexford, was 5th in Junior Hurdles. Oisín Kehoe, CBS Wexford, was 4th in Minor Long Jump while school-mate Darragh Collins was 4th in Inter Steeplechase. Chloe O’Toole of Presentation Wexford was fifth in her 200m. New Ross athletes who competed valiantly but finished outside top three in their events were Finn Kelly, Louise Doyle and Aidan Shannon. Ditto for Jessie Akinyemi Presentation Wexford and Alex Gregg Wexford CBS. Tagged South Leinster Schools T&F 2018, Wexford athletes at South Leinster Schools T&F 2018. Bookmark the permalink.